Killer Characters: Hallowe'en in a Castle? Okay, so... with ghost hunters in my castle it's definitely timely to think of what we'll do for Hallowe'en this year... but I'm torn. I live in a castle... a big, old castle where a couple of murders have occurred, one memorable recent one while I was having a freaking Hallowe'en themed party! Do I really need to emphasize that by decorating and hosting a seasonal event? But I can't just ignore the season... Wynter Castle is a popular spot for the locals to cruise by Halloween night anyway. They are going to come by anyway, even if I do nothing. So... consider that I own a property that is already considered haunted, where a murder occurred during a Hallowe'en party just a year ago. And right this minute I have a big group of television ghost hunters (who are driving me absolutely nuts, making ME want to kill someone this time!) doing their thing, wandering around the castle in the dark with beeping meters that light up when a 'ghost' is near... when they're not arguing or fighting, that is. We'll be lucky if we get out of all of this sane! And the whole town of Autumn Vale is in an uproar over the ghosthunters. Some of the locals are telling them tales of hauntings at Wynter Castle! Just what I needed, right? 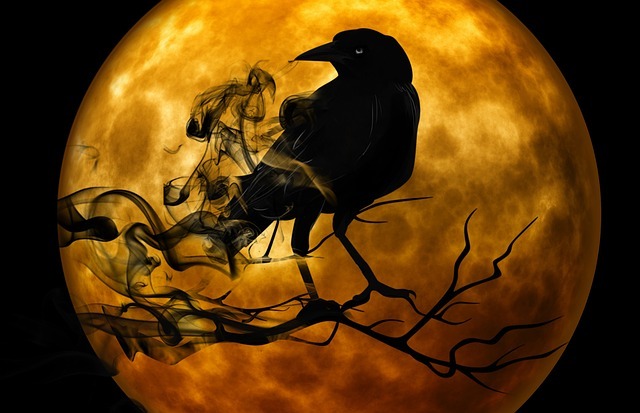 So once they're gone, and Halloween is here, I need to figure out how to handle it this year, get in front of it so I don't have cars full of teenagers egging the place or something. What would YOU do Halloween Night if you were me and owned Wynter Castle? A) Turn all the lights out and pretend we're not home Hallowe'en Night? B) Turn all the lights ON and give tours, proving there are no haunts in the house? C) Say to heck with all that, let's sing Ghouls Just Want To Have Fun and PARTAY? Tell me... what would YOU do? 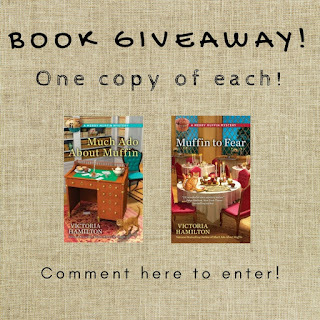 Comment here to enter to win a copy each of Much Ado About Muffin & Muffin to Fear! American and Canadian addresses only, please! Enter by Midnight, October 22nd. *Please note... entries posted after Midnight on the 21st will not show until they are approved the next day! So never fear... we gotcha! I think I would do the last one. Let's party and invite everyone. I'd say TURN OUT THE LIGHTS!!!! Then have your own private party!!! Think I would have fun and party. Thank you for the chance. I would love to win. I love the covers of both books. Give Tours and charge for it...I used to do ghost tours on the side and it was a lot of fun... at least you'd know who was lurking ad where...lol.. I would definitely do a tour. I would do C Sounds like a perfect night to have some fun with the ghouls. Let's give them something to talk about and have a party!! I like C the best! Haha! C! I love Halloween and a party!! I go with "C." Let's PARTAY! I am quite sure, Merry, that you can come up with some wonderful tasting, but freakish looking, muffins to serve. Where we live we don’t get anyone so it would be a party for 2! Thank You for the chance!!! Definitely C. - party the night away! I say PARTY! Thanks for the chance! This is such a wonderful giveaway. Party away. B. Give tours and hope it is haunted! Party sounds like a good idea. Thanks for the chance. I forgot to leave my info with my answer. Let's just party!!! I think I would do C and hope some ghosts want to party. Thanks for the chance to win. I would say lets party. 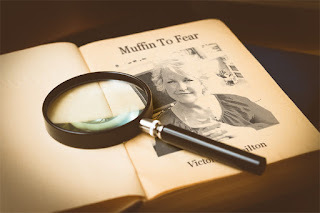 Muffins and ghost hunters? Can't wait to read them. I think I would do B and C together. Thank you for this great giveaway. Oh, I would most definitely have a party, and I’m the anti-social type!! (Not sure first went through) I would have a masquerade party--dressed in period pieces and or ghostly costumes. I've always daydreamed of living in a castle or old mansion. Absolutely C) Say to heck with all that, let's sing Ghouls Just Want To Have Fun and PARTAY? I have to go with have fun and PARTAY! Might as well invite the ghosts and spirits to the partay. You probably won't get egged if you do c. Haven't read these, yet. Would love to win! Thank you! crys101497@yahoo.com. Agnes azelgert@gmail.com My choice is C PARTAY. Thanks for this opportunity! C. A party always makes everything better. C, but I'm a huge Cyndi Lauper fan! Lol. I like Robin Coxon's idea-- sage sticks and then option C! Thank you for offering the giveaway! kim7corn (at) gmail (dot) com. Sing Ghouls Just Want to Have Fun and Partay! I go for option C. What the heck,right?